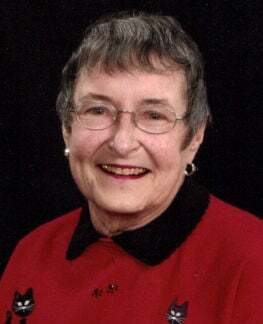 Jacquelyn Ann Kouba, age 78, passed away at MCHS in Eau Claire on Wednesday, May 27, 2015. She was born on Sept. 29, 1936 to Carl and Hazel (Maxwell) Lueck in Chippewa Falls. She graduated from Bloomer High School in 1954 and attended UW Madison and USC San Diego until she married James Kouba on Oct. 27, 1956 in San Diego, California. Jackie was a stay-at-home mom until her children were old enough to go to school. She then worked for Dan’s Auto Parts, Chetek Savings and Loan, Barron County Savings and Loan in Bloomer and Wipfli CPAs in Eau Claire. She also served as president of Chetek Chamber of Commerce and Town of Cooks Valley Treasurer. Jackie enjoyed reading, playing bridge, listening to country music and line dancing before she got confined to a wheelchair. Her true joy in life was spending time with her grandchildren that she loved dearly, especially attending all their sporting events. She is survived by: her husband, James of Bloomer; daughters, Jennifer (Larry) Commans of Los Angeles and Dr. Jodi (Todd) Bohl of Elk Mound; daughter-in-law, Carol Kouba of Washburn; grandsons, James Kouba III of St. Louis Park, Minnesota, Robert Kouba of St. Paul, Minnesota, Matthew Kouba of Washburn, Brandon and Ryan Bohl of Elk Mound; siblings, Sue (Dan) McDermott and Larry (Artie) Lueck both of Mesa Arizona; sisters-in-law, Helen (William) Ruf of Chippewa Falls, Lucille (Greg Levine) Kingsbury-Levine of Duluth, Minnesota and Jodeen Kouba of Eau Claire; numerous nieces, nephews, other relatives and friends. She is proceeded in death by: her parents, Carl and Hazel; children, James Kouba Jr. and Jane Kouba; and niece, Rhonda Ruf. Funeral services will be held on Monday, June 1 at 1 p.m. at St. Paul’s Catholic Church in Bloomer with a visitation from 4-8 p.m. on Sunday, May 31 at Olson Funeral Home in Bloomer. Interment will take place in the North Catholic Cemetery in Bloomer.